The testing of a B61-12 nuclear bomb at the Tonopah Test Range in the U.S. state of Nevada is provocative and confirms U.S. intention to keep in Europe its current nuclear weapons that can reach as far as Russia, Russian Deputy Defense Minister Anatoly Antonov told reporters on July 13. "The U.S. actions in the current situation are utterly provocative and run counter to Washington's stated commitment to full nuclear disarmament. They reaffirm the U.S. intention to keep its nuclear weapons deployed in Europe, which are capable of reaching Russian territory, and to ensure their maximum combat efficiency," said Antonov, commenting on the B61-12 nuclear bomb test carried out in the U.S. 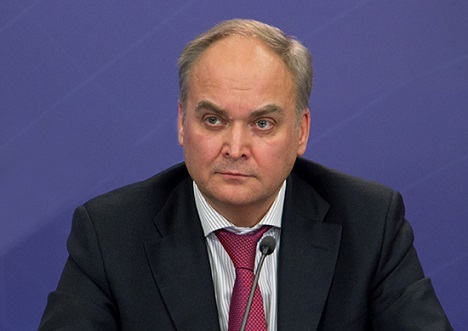 The Russian Defense Ministry "has not left without notice the B61-12 nuclear bomb test conducted by the U.S. without nuclear warhead detonation, on July 1, 2015," Antonov said. "The tested nuclear bomb is a dual-purpose bomb," he said. "It can be both an element of strategic offensive weapons when delivered by heavy bombers and a non-strategic nuclear weapon when delivered by tactical aircraft. What made this test special was the fact that it used an F-15E fighter and bomber aircraft as a nuclear weapon delivery vehicle. This gives reason to suggest that the test aimed to test the possibility of the B61-12 bomb being used by NATO's fighter bombers based in Europe," the deputy minister said. The Russian Defense Ministry sees it as "testament to the U.S. stubborn reluctance to stop using NATO non-nuclear members in conducting joint nuclear missions which is in direct disagreement with its obligations under the Treaty on Non-Proliferation of Nuclear Weapons (NPT)," Antonov said. "Thus, under the guise of the notorious and trumped-up Russian threat, the U.S. has not only been building up its military potential and NATO activity near Russia's western borders, but it has also been upgrading its nuclear arsenal," the deputy minister said. "Such U.S. nuclear bomb tests cannot be regarded as a move that can have a positive effect on the international situation," he said. "Irresponsible actions of this sort are not making the world safer and calmer. They are sending a wrong and alarming signal to international community. It is particularly important to remember it now, given the ambiguous results of the May 2015 NPT Review Conference," the deputy minister said.